Mad Max: Fury Road filming and environmental damage in Namibia. The cautionary tale of resource scarcity actually caused harm during filming. This article first appeared on the website of Pacific Standard magazine. Here’s a drinking game: Sit down with some friends and talk about modern life and fossil fuels—supply, demand, embargoes, carbon, cars, batteries, whatever—and see how long it takes for someone to mention Mad Max. Ever since 1979, when an Australian ER doctor named George Miller and his friend James McCausland released a bootstrapped film about a bunch of gnarly drifters driving around looking for gasoline after the apocalypse, Mad Max has become the cultural reference point for fossil fuel depletion and the dystopia that ensues when “people don’t believe in heroes anymore.” Indeed, the film’s rather didactic modern fable has been highlighted in all sorts of serious discussions about resource depletion, oil dependency, chaos, and environmental collapse. Of course the production of Mad Max: Fury Road wasn’t adequately green—that’s entirely predictable, given the 800-person crew and fleet of freakish vehicles. What’s more interesting is that environmental degradation—of the type that makes us stop believing in heroes—doesn’t necessarily look bad or ugly. In fact, the movie was filmed in Namibia in the first place because of changing climate. For a decade or so, Miller planned to shoot the film in Australia, in the New South Wales desert town of Broken Hill. But freak rains have turned the formerly dry-as-an-apocalypse area into a field of bobbing wildflowers. Really. And fields of wildflowers, while they may be real signs of ecological calamity, do not read as such on the screen. So the film had to up and move to Namibia, which boasts a desert landscape—with a healthy but nearly invisible lichen crust—that appears properly damaged to Western eyes. Whew! Namibia may have nearly looked the part, but creating a fable about the effects of environmental destruction predictably still required quite a bit of mutilation—in a fragile place whose yearly rainfall is measured in wisps of fog, where tiny crusts of lichen take decades to develop. On a message board devoted to the film, a tourist wrote that he or she heard from a guide that the crew “brought in sand to simulate a more desert like enviroment (sic).” A “lonely tree” apparently looked a little too lonely—“new branches had to be glued” onto it. Of course this is hearsay, but it shows how cinematic environmental ruin is at odds with the real. 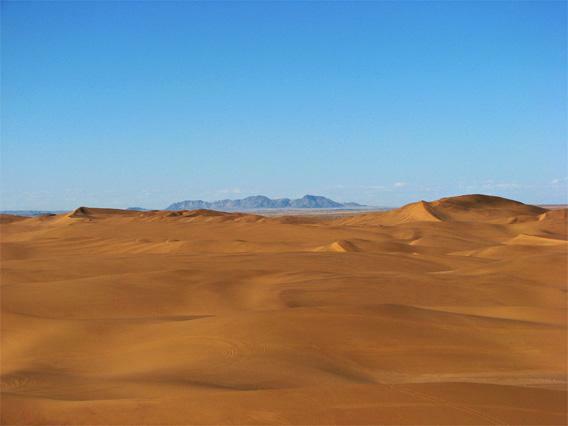 More seriously, a resident of the major regional town of Swakopmund complained that the crew was “systematically” destroying sensitive dune ecosystems and rare animal habitats in the Dorob National Park. “The Mad Max people go where they want, when they want,” Kit Collard wrote in a letter to government ministers that got a lot of press in Namibia. Apparently this complaint was echoed by the more influential coastal conservation commission. Environmental impact aside, the shear surrealism of Mad Max: Fury Road’s experience in Namibia reveals the limits of the fable. Mad Max’s implicit warning about the perils of gasoline dependence makes intuitive sense to Americans and Australians—sitting in traffic jams, we feel we’ve become morally soft. In Australia, there are 551 cars per thousand people—cars are part of the culture and soul of the country. But in Namibia cars are a rarity. For every thousand Namibians, there are 52 cars. So this “Road War” is being shot in a country with very few roads, and only 14 percent of them are paved. It’s a little perverse to use Namibia to teach the developed world this lesson. For Namibia and other under-developed countries, burning more fossil fuels offers one path to social cohesion and environmental preservation—the very opposite of collapse. The average Namibian creates just 1.4 metric tons of carbon a year, while the average Australian creates 16.7. In 2010, only 34 percent of Namibians had access to electricity, which means they cut wood or other biomass to cook dinner. Increasing electrification in Africa preserves remaining forests, cuts the time people spend scavenging wood, improves health, and, because of electric lights, creates more opportunities for education. (Of course, Nambians don’t have to use fossil fuels to make electricity; they could use solar or nuclear.) Per capita, Americans use nine times as many kilowatt hours as Namibians do. All of that energy gives Americans a certain degree of control over our destinies—we can work in IT rather than tilling the land; we can avoid asthma attacks by cooking over an electric stove rather than a wood fire. We are engaged in a Rube Goldberg-esque machine that turns energy into economic value, and it has meant that we keep our antibiotics in the fridge and leave the trees standing when we cook dinner. We in the first world obviously need to make our own factory way less carbon intensive. But there’s nothing inherently evil about creating progress itself. Namibia also provides a slightly bizarre counter-argument to the fears of resource scarcity that run through Western culture from Malthus to Mad Max. With a stable government, a smallish population of 2 million, and 10 percent of the world’s uranium, Namibia is not on the verge of running out of anything except water and arable land. The country literally has a beach covered in diamonds; as with all diamond producers, its main challenge is to extract diamonds from the seabed slowly enough to maintain high prices. The perception of scarcity is an important commodity itself in hypercapitalist societies—it’s what keeps stock prices high, makes lines form outside the Apple Store, and gets people asking $10,000 for a ticket to the Hurricane Sandy benefit concert. Fear of scarcity is as vital to our culture as consumption—which is part of what gives the Mad Max fable its power. Finally, there was something a bit sour about the way the film production hired local boys to portray the downfall of civilization. The boys, who were recruited from three local high schools, said they sometimes started work at 6 a.m., when the desert can be cold. They earned between $12 and $59 per day for riding around in the backs of trucks without shirts on, embodying the myth of the African with nothing left to lose. According to the local paper, the boys were chosen because they were “tall and skinny and had a certain look in their face.” What was that certain look? Maybe they were worried about missing their exams. Namibian media reported that parents and high school principals were angry that the boys were missing too much school. The boys themselves reportedly said that being extras was “fun, but not worth it,” suggesting that they had a very good sense of what they had to lose. Anyway, the meaning of “skinny” is entirely different in Namibia—which currently has high HIV rates—than it is in Hollywood. I’m not dissing Fury Road. I’ll definitely go see it. What I will stop doing is using Mad Max as shorthand for a fossil-fuels-and-the-fall-of-paradise parable that simply isn’t true. Paradise is falling all the time—but in unexpected ways. It could be that perpetuating the Mad Max vision of disaster could even blind us to realities—like when environmental apocalypse is a field of flowers in the wrong place. The truth is that we, not high-school boys from Namibia, are those people “who will do anything” for fuel, even pay for gasoline on credit cards with 28 percent interest. My advice for the next Mad Max: Avoid national parks, and find something more actually downfallen, like abandoned shopping malls.